Thunder-Tiger SSB - TTR 6703 • (Radio Controlled Model Archive) • RCScrapyard. RCScrapyard ► Iconic Vintage Radio Controlled (RC) Model Car Archive ► Thunder-Tiger SSB. 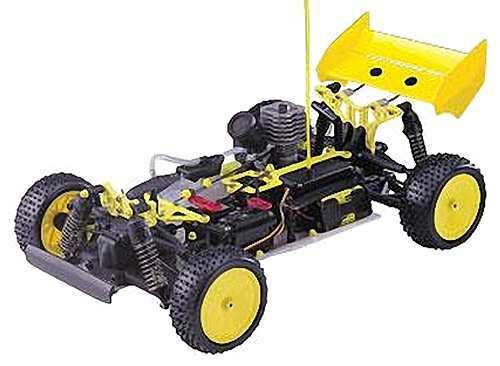 Introduced by Thunder Tiger in 2001, the 4WD SSB Buggy - TTR 6703-F - came ARTR with PRO-15BX (P) engine and clear bodyshell, but no radio, or RTR - TTR 6703-F4 - with PRO-15BX (P) engine, radio system and painted bodyshell. The TT model is shaft driven, on an alloy plate chassis, with gear type differentials, coil spring over oil filled dampers, rear dogbone and front universal joint drive-shafts, dogbone prop-shafts, two-speed transmission and a full set of ball bearings. To race the TT SSB, it must be fine tuned to improve handling, provide responsive steering and give you the grip to cruise around corners at high speed, without slipping off the track. Small adjustments can make a Big difference and our step by step procedure, will guide you to the best Set-up for your individual driving style. 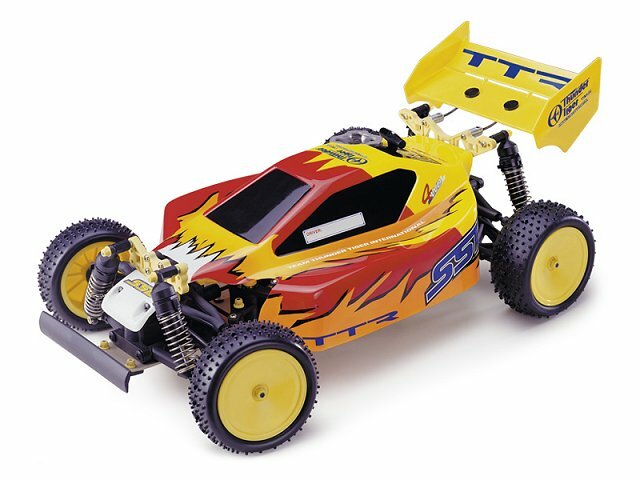 Buying a used Thunder-Tiger SSB Nitro Buggy, or any used RC Model, has a number of advantages. It is generally cheaper than new, ready built and may come with a variety of expensive hop-ups already installed. Cheap, pre-loved bargains are always becoming available. However, depending on the age of your purchase, it may need a little tender loving care before you can take it out on the back yard. The one thing you will always need is an instruction manual. If not supplied with your purchase, they can often be downloaded from the Thunder-Tiger website, or purchased separately on eBay. With an instruction manual, any problems with your model Buggy you may discover can easily be fixed. 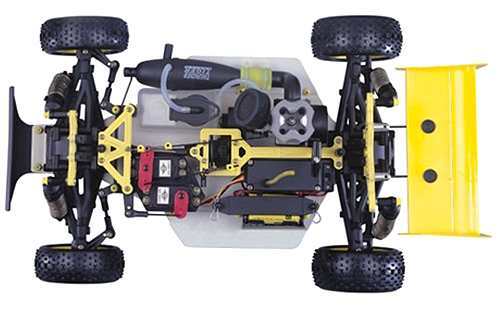 When you receive your used Thunder-Tiger Buggy, make a general visual inspection of the chassis, front and rear wishbones, suspension shock towers etc, for any broken parts that may need to be replaced. Then, take a screwdriver and box spanner and check each self tapping screw and nut for security, taking care not to over tighten. Next, for those Thunder-Tiger models with oil filled shock absorbers, remove them from the chassis and dismantle the coil springs. The damper shafts should push in and pull out with a smooth action. If you feel a jolt as you change direction, this means the oil has leaked out and must be topped up. At the same time, change the O-Ring seals to prevent more leakage. Also check the damper shafts for damage. If they are scratched, change them as soon as possible. If the body shell of your Thunder-Tiger SSB is broken, ripped or damaged in any way, this can be easily repaired with rubber solution glue. Also, for added protection and if available for your SSB model, fit an under guard to stop dirt and gravel entering the chassis. If you intend to race your SSB Buggy model at a competitive level, I would also recommend you obtain and fit titanium pivot shafts, turnbuckles, tie rods and steering rods. The gearbox of your used Buggy should be opened up to check for gear wear and lubrication. A thin coat of grease is often used on internal gears and although this is fine for basic running around on the back yard, if you intend to race your Buggy at a higher level, this should be removed and replaced with racing oil (ZX1 or Teflon Oil). Of course, this should be reapplied after each race meeting. Gears are a weakness on all Buggy RC models. Head on collisions can easily damage the gear teeth on nylon and plastic spur gears. Heavy impacts can also loosen the nuts or self tapping screws that hold the Nitro Engine in Position, allowing the pinion gear to pull out of mesh slightly and rip the tops off the teeth on your spur gear. To minimise this possibility, fit bolts with locking nuts to the Nitro Engine mount and remember to check them for security after every two or three runs. Ball joints always cause problems. For top level Nitro Buggy racing, the plastic ball connectors should be checked and if deemed necessary changed after every meeting. A simple thing like a loose fitting connector popping off could easily end your race, so better safe than sorry. The SSB steering servo is also prone to damage. In high speed crash situations, the fragile gear teeth of the servo can be broken off, rendering your expensive servo useless, so be sure to obtain a good quality "Servo Saver". Check out my Servo Information article. If body roll on your Thunder-Tiger SSB is a problem, handling can be improved with the use of stabilizers, anti roll or sway bars, stiffer tuning springs and, or, thicker silicone oil in the dampers. If your used Thunder-Tiger Buggy comes with plastic and sintered brass bushings (ring type bearings), check the shafts that run in them for wear. Dust and grit can get into these bearings and abrade the shafts. Therefore, you should replace them all with shielded ball bearings. If the model has been run with ring type bearings, you may have to change all the axles and driveshafts. For more information, take a look at my article, How to get the best from your Bearings. Finally, good luck with your SSB model and good racing. More often installed on off road RC Models, the Slipper Clutch has been around since the late 1990s. Basically the idea is to prevent wheel spin and increase traction under acceleration, to improve the cars stability from a standing start, when landing from jumps or on corner exits. It also protects the spur gear and drivetrain, to some degree, when using a high torque motor. The design is quite simple, employing two independent metal plates, one generally fixed to the spur gear and the other to the drive mechanism, clamping onto a fibre or rubber ring or pad. Adjustment is commonly achieved by slackening or tightening a spring loaded nut on the end of the spur gear mount. Setting up the slipper clutch can take some time and is a matter of individual preference, but normally the way to do this is from a standing start, jamming on the throttle and simply getting the feel of the car for that particular surface, being grass, gravel or dust. Personally I adjust it to give me around a metre and a half slip, before it achieves full drive. Wear on the slipper clutch is natural and often has to be readjusted after each race. The Hydra-Drive, or Fluid Coupling design has actually been around since the 1950s, but only came to RC a couple of years after the introduction of the slipper clutch. In principle, the Hydra-Drive is supposed to give similar results to the slipper clutch but need less continuous adjustment. In practice, for me anyway, it was not easy to live with. Hydra-Drives employ two independent impellers, immersed in silicone oil and enclosed in a sealed housing. Again, like the slipper clutch, one impeller is fixed to the spur gear, the other the drive. As power is applied, the spur gear will spin its impeller, until through the oil, drive is picked up by the drive impellor. The only real way to adjust the drive was to change the oil viscosity, or in some, the gap between the impellers could be adjusted by shims. All this took time and as far as I am aware, the Hydra-Drive is no longer used in RC. When you first build your RC model, you will sometimes find that there are a number of different pistons in the kit, with varying numbers of holes or hole sizes in them. Generally, the manufacturer will suggest one particular piston in the car manual and may provide you with a mid range oil weight, but depending on the type of terrain you intend to race your model, their suggestion may not be the best for your needs. When it comes to tuning your dampers there are basically two things you need to know about pistons. "Pack" and "Static Damping". Pack, is the speed your damper reacts to any quick compression and can be considered to be a consequence of the size or number of holes in the piston. Smaller holes, more pack, larger holes, less pack. Static Damping is the amount of resistance you sense when slowly pulling or pushing the piston rod in and out of the damper. As with pack, this is related to the number or size of the piston holes. Larger holes, less static damping, smaller holes more static damping. Setting up your dampers is a matter of trial and error. With the car in full race mode, that means with everything installed, place it on a table, then pick up the rear of the car, raising it around six inches and drop it onto the table. The chassis should dip slightly below then back up again to the pre-set ride height, in one smooth movement. If instead, it slaps down onto the table, the pack of your dampers is not enough. In this instance, depending on the setup you are testing, you have two options, thicker oil or smaller holed pistons. If when you do the test the dip is hardly any, then the pack is too hard and you should try thinner oil or bigger holed pistons. Repeat this process for the front of the car. Finally, with both ends adjusted, pick up the entire car and drop it from the same height. Both ends should respond equally when dropped, if not, change your pistons or oil weights until they do. After your basic setup, you then need to test your car on the track. If the rear of the car tends to hop excessively over small bumps, the rear dampers have too much pack. You need to change the pistons on the rear for larger holes and also use thicker oil to maintain static damping. If the car chassis bottoms through small bumps and landing on jumps, the pack is not enough. In this instance, change for smaller holes and thinner oil. If the car lands nose up from a jump, this is indicative of the front dampers having too much pack. These should be adjusted as described above to keep the car static damping in balance. Nose down obviously means not enough pack ….. I hope this article has been helpful. Good luck and good racing.